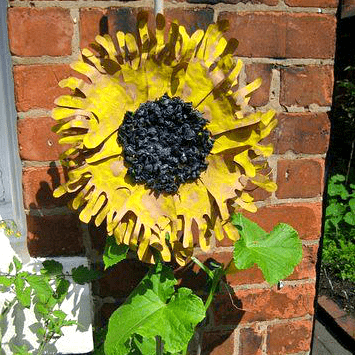 This handprint sunflower craft is easy and so fun to make, and looks glorious! I do love handprint crafts, and this one is glorious. These handprint sunflowers look great as an individual piece of art – imagine a whole wall filled with them! 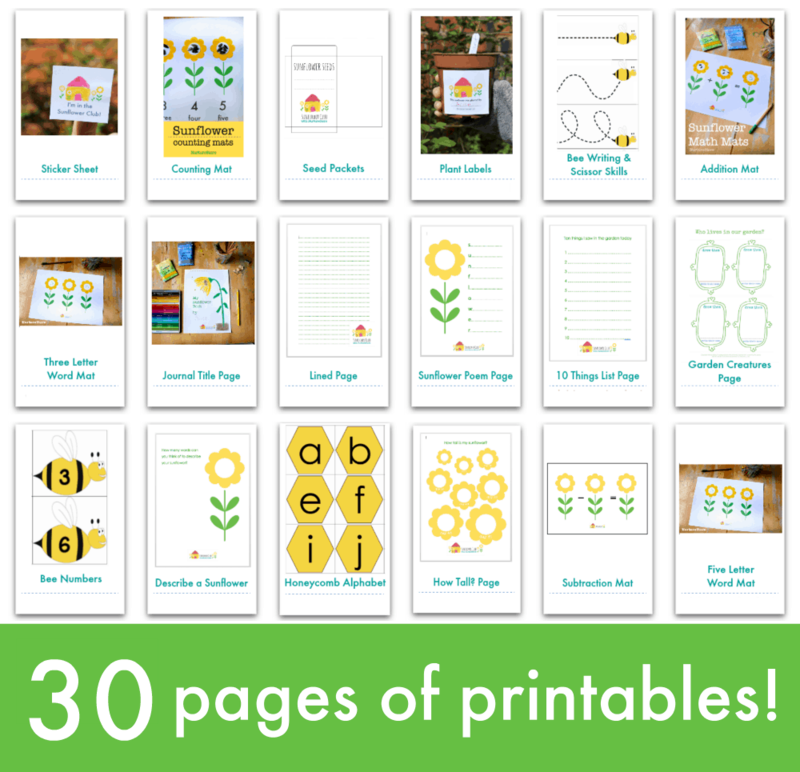 – and they are also the perfect thing to place at the top of your sunflower height chart. Set out a large piece of paper with a plate/dish of yellow paint. Once the handprints are dry, cut them out with scissors. Glue or staple the cut-out handprints around the outer edge of a paper plate, over lapping them to create the petals of your sunflower. Scrunch up small pieces of black or brown tissue paper and glue them into the centre of your paper plate to be the sunflower seeds. 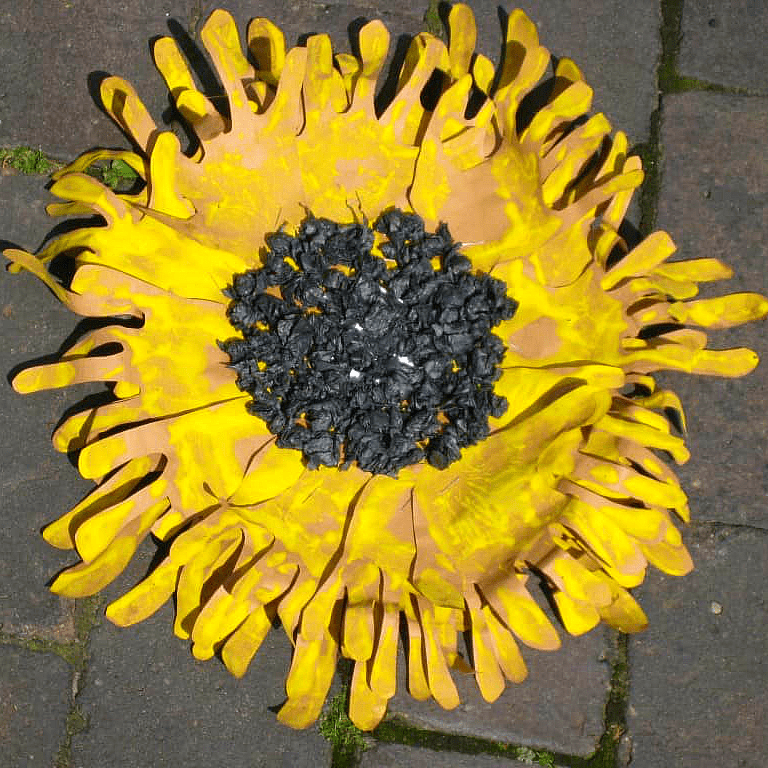 A family or class can collaborate to create a sunflower with handprints from the whole group. 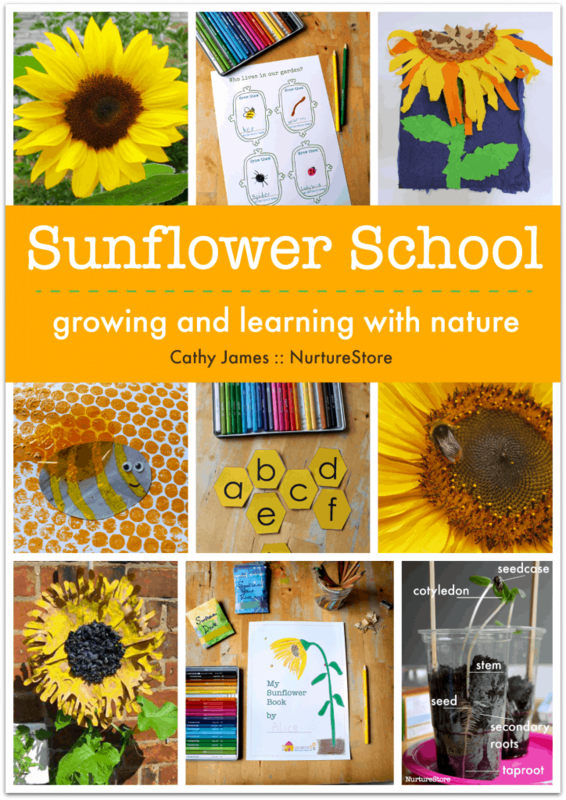 Alternatively everyone can make their own sunflower and you can create a garden of them. You can make a stalk from a garden cane, or from card, and fix your sunflower on top. 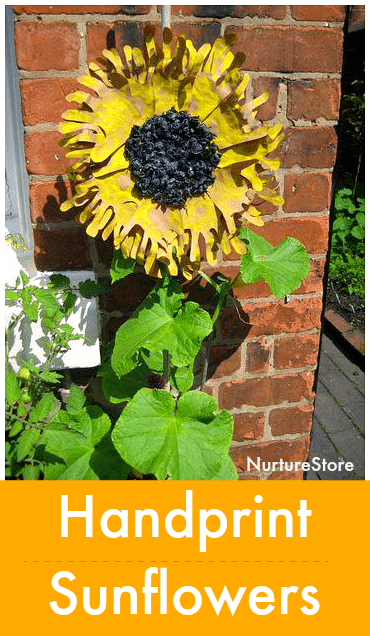 The handprint sunflower is also the perfect topper for our sunflower height chart project. I LOVE this! We got our sunflowers in the ground a bit late this year so I have been bracing myself for less-than-spectacular end results. Now, come what may, we WILL have awesome sunflowers! Ooooh, how very pretty Cathy. Love the way you used the hands to make the petals! Fabulous! Love it! I want sunflowers now. Loving the different takes this week. Great idea to make sunflowers out of hand prints, will have to try it with mine. I love sunflowers and those handprint flowers are fabulous 🙂 We made a peacock with the children’s handprints in many colours as his magnificent fanned tail, it was very lovely! That’s a fantastic idea Christine – we might try one. Oh wow, this is awesome! I didn’t know about the sunflower club, but Chipmunk has been lovingly growing his own for the last few weeks. Maybe we can link up- or are we too late?! How cute! We made a hand print flower for Mother’s Day, but it didn’t look nearly as nice. I love this! We grew sunflowers this year too! I need to try this with the little gardeners. You’re invited to Of Such is the Kingdom’s first birthday blog bash! Come to see old posts revisited and to win lots of prizes! that is great love it will be bookmarking it for fall! I have always wanted to grow sunflowers and must give it a go once the weather warms back up on this side of the world. What a wonderful idea!! One for the to do list!! I love this, I’m doing it!